Two weeks ago was the State of the State address (the talk), this week: the budget proposal (the walk). The budget is a big deal for the state, because it's the Cuomo administration putting its money (actually, all our money) where its mouth is. The budget includes a handful of provisions intended to help local governments -- many of which are scraping to get by. The "Tier VI" for public pensions instituted last year projects to save local governments a lot of money -- in the future. (The workers in Tier VI were only recently hired, or have yet to be hired.) 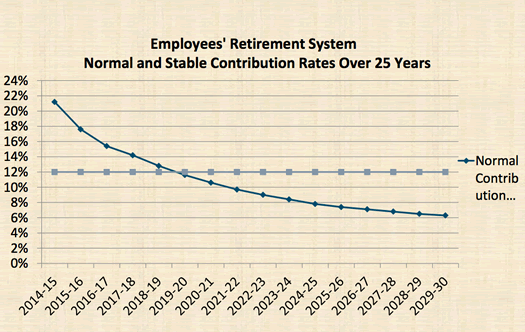 So the budget includes a provision that would allow local governments to lock in a pension contribution rate that would be lower than it otherwise would be now -- and hold that rate constant over many years. The theory is that would help them save money now, but down the road they would be paying a higher rate than they otherwise would be without the lock in. The graph above, from state budget director Bob Megna's slide deck, probably depicts this better. Example: This provision is projected to save the city of Albany $8 million in the first year, according to the Megna's presenation. The budget holds constant the aid distributed to municipalities from video lottery terminals. In the last budget Saratoga Springs got $1.5 million, and Saratoga County just under $500k. Allowing local governments to renew their sales tax rates without state legislature approval (increases would still need the OK), and a bunch of items filed under the ever-talked-about category "mandate relief." The budget bills include a provision to increase in the state minimum wage, from $7.25 to $8.75 per hour. The Cuomo admin says that increase would affect 705,000 workers and collectively raise wages by $1.01 billion per year. The size of the state workforce is "expected to be relatively stable" over the next budget year, according to the briefing book. This isn't really surprising, a lot of the drama was worked out last year when the new union contracts were negotiated (and included concessions such as no general raises last year and this next year). Interesting bit: the size of the state workforce in "agencies directly controlled by the Executive" is down from 137,680 in 2007-2008 to 118,878 in the current year (2012) -- that's down 18 percent. The proposed budget includes $20.8 billion in school aid, an increase of 3 percent compared to the last year ("Most of the allocated increase is provided to high-need school districts."). The Cuomo admin says education aid represents 28 percent of the state's general fund spending. The budget also includes $203 million in "Fiscal Stabilization Funds" for school districts. + Bar exam for teachers: pretty much what it sounds like. + Full day pre-K: $25 million, "targeted toward higher need students in lower wealth school districts via a competitive process." + Extended school time: $20 million, "prioritized to support high-quality extended school day or extended school year programs, with academically enriched programming." + High-performing teachers as mentors: $11 million, for $15k annual stipends to "the most effective teachers in the State" -- "This program will begin with math and science teachers." The budget includes a bunch of different provisions relating to Sandy, Irene, and Lee recovery, as well as provisions to preparing infrastructure for future storms. Among the provisions: $2 billion for "Community Reconstruction and Mitigation Plans," the zones for which cover parts of the Catskills, Schoharie, Mohawk River, and Hudson Valley (map in this video at 45:30). The budget includes a "a comprehensive customer service improvement initiative" aimed at reducing wait times at DMV offices to 30 minutes or less, and adding Saturday hours at some locations. Here you'll find appropriations, budgeted and actual spending, charts, and historical budget information. See how your taxpayer money is spent. Read Governor's Budget Messages going back to 1954. Opening this data to researchers, taxpayers, and the public will add to the field of knowledge, spark innovation, and help improve government. The most interesting part might be the historical budget information, some of which stretches back to 1954-1955. + Cuomo admin press release about proposed budget. + The "briefing book" (pdf) for the budget. + 2013-2014 budget home page. A linked list of 2013-2014 budget legislation. "+ Bar exam for teachers: pretty much what it sounds like." Given the numbers of newly-minted teachers in NYS, the backlog of laid-off teachers, and the dismal hiring outlook at local school districts, I suspect that the only bar exam that education graduates will be taking this year is for mixing Alexanders, Manhattans, and White Russians. I understand from several news sources that Gov. 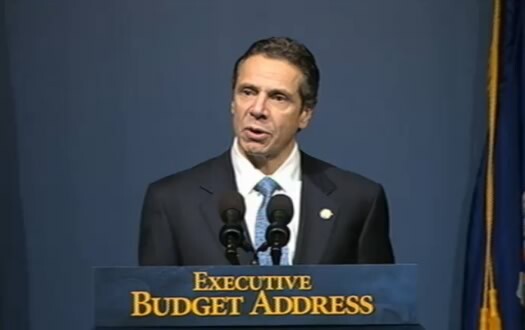 Cuomo's budget presentation was pre-recorded, and he actually lip-synced it.